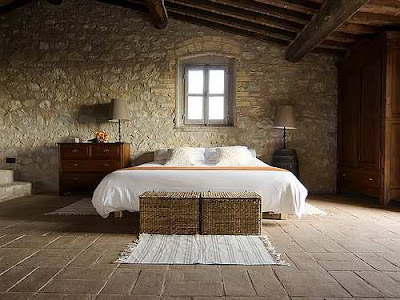 Continuing with the theme of international décor, we thought we'd share some tips on Italian style, both rustic and country. * Italian country homes typically have whitewashed walls, or you may find warm terra cotta tones selected as accents. * Generous use of natural woods ... both exposed ancient beams and in massive furniture pieces. Dark wood tones are prevalent. * Flooring is commonly stone or tiles ... again in shades of terra cotta and reds. With warm Italian weather, cool tile flooring is a balm during those summer seasons. * Exposed brick and stone is guarded or restored in old Italian country homes, providing an authentic rustic atmosphere.